After Danny is killed in a road accident, the Doctor and Clara travel to the Nethersphere in search of him. Who is Missy working with to harvest dead human bodies? And who exactly is she? In a show which so regularly brings us the fantastical, the fact that Danny‘s death – barely two minutes into the episode – is so mundane, arbitrary and abrupt makes it all the more shocking and difficult to process. There’s no dramatic sacrifice, no big, meaningful speech – merely a conversation cut short followed by a stranger’s voice on the other end of the phone. It’s no wonder that Clara, for whom the extraordinary is her ordinary, has so much trouble accepting it. Dark Water‘s one disappointment is that Danny’s secret trauma – he accidentally killed an innocent boy while serving in Afghanistan – is something of a let-down, having been built up so much during this season. But the fact he then has to confront that child after arriving in the Nethersphere is a chilling concept. His final declaration of “I love you” to Clara to push her away and save her from doing something stupid in her desire to reunite with him underlines what Danny Pink has always been: an ordinary hero, in stark contrast to the other man in Clara’s life, the extraordinary alien. Nobody deserves anything. But I am owed better. I am owed. Throughout this season, Clara has been forced into the Doctor‘s shoes on a number of occasions. It’s her ingenuity that reboots Rusty in Into the Dalek. Humanity’s fate comes down to her at the end of Kill the Moon. The Doctor compels her to lie to Maisie in Mummy on the Orient Express, a necessary survival skill which proves vital in Flatline when she takes over the Doctor’s identity and his role as a leader. The beginning of this episode shows just how well she has learned those lessons, even picking up some of his verbal mannerisms (“shut up, shut up, shut up” and “so that’s a thing”) before responding to Danny’s death just as the Doctor would do – setting aside her grief and focussing on what she needs to do to get the job done, lying to the Doctor in the same cold and calculating way she has seen the Time Lord do to others so many times. And in her subsequent conversation with the now dead Danny in the Nethersphere, she hints that she will do anything to see him again, even if that means dying herself so that she can cross over. Danny pushes her away once, but given the opportunity will she grab it? Have we already seen some foreshadowing of how this might occur in the Doctor’s detailed explanation of the consequences of a paradox loop during her dream state? Could Clara sacrifice her own timeline to restore Danny and perhaps save the day too? I’m almost certainly wrong, but it’s a thought. I know I’ve said this repeatedly this season, but Jenna Coleman‘s performance in this episode is magnificent, selling Clara’s suppressed grief, desperation and hope perfectly. She has been every inch the equal of Peter Capaldi. Grumpy and sometimes callous curmudgeon that he is, the bond between the Twelfth Doctor and his companion is unmistakable. Even after Clara betrays his trust, even after he tells her they can’t just save Danny, he’s willing to take the safeties off the TARDIS and go in search of the afterlife to help his friend. It’s a touching reaction which confirms that, just as his predecessor hid his age and his dangerous nature behind a youthful face and a boyish grin, this Doctor’s gruff exterior is also a mask of sorts. He may even doubt himself but, when it comes to people he cares about, this Doctor is fundamentally a good man. This isn’t really an afterlife. It’s just more life than you were expecting. For anyone who has experienced bereavement or who has strong religious beliefs relating to life after death, this episode makes for uncomfortable viewing. It’s not dwelt on too heavily, but the idea that dead people continue to feel what happens to their bodies after death, including cremation, is particularly creepy. Equally, the existence of any form of afterlife and its representation as the Nethersphere is both potentially unsettling and religiously contradictory – and that’s before considering that the dead are being turned into an army of Cybermen and held in stasis. The opening half of a two-parter is always as much about setting up the second part and building towards a big cliffhanger as it is about delivering big setpieces, and Dark Water achieves those objectives well. Essentially action-free, it delivers its two big punches at opposite ends of the episode – Danny’s accident and the Missy/Cybermen revelations – while in between weaving a strong character piece which resets the Doctor/Clara/Danny triangle and gives us some fantastic scenes in which Michelle Gomez‘s Missy finally gets the chance to play opposite our two main characters in scenes that crackle with playful mischief and puzzling mystery. There’s also none of Steven Moffat‘s signature intricacy: the story’s timeline is linear rather than timey-wimey, and references to every previous episode aren’t shoe-horned in other than a direct reference to Listen and a number of character beats which echo developments which have been seeded along the way. It’s been a hallmark of this season that most of the stories have been much more character than action-driven, with much of the drama to be found in small, quiet moments rather than big CGI sequences. This is a good thing. With Missy now revealed as a new, female regeneration of the Master – thank God it wasn’t the Rani! – and Cybermen roaming the streets of London, from last week’s ‘Next Time’ trailer we already know that in part two we’ll be seeing the return of UNIT, Kate Stewart and Osgood, rockets being fired out of the cupola of St Paul’s cathedral, the Doctor falling from the skies and Clara apparently claiming that “Clara Oswald has never existed”. But how will the Doctor and/or Clara save the day, can Danny be saved and will the rumours of Clara’s departure be proven true? Seven more days until we find out. One of the Doctor’s hiding places for his TARDIS keys is inside a copy of Audrey Niffenegger’s book The Time Traveler’s Wife. The Cybermen’s teardrop eye shape pops up in several places in the 3W institute, from an RIP sign to windows. Even in the Nethersphere they still can’t get a reliable wi-fi signal. Clara’s birthday is November 23rd, the date the show’s first episode was initially broadcast in 1963. The episode’s conclusion makes visual references to two Second Doctor adventures: the Cybermen emerging from their watery tombs echoes Tomb of the Cybermen, while their march through London with St Paul’s Cathedral in the background is a nod to The Invasion. This was a phenomenal episode – heartfelt, chilling, witty and well structured. It’s easily Moffat’s best finale (if the second part matches it, of course). Coleman was superb and the Doctor’s betrayal makes no difference speech was beautiful. Absolutely loved it. Here’s a link to mine. 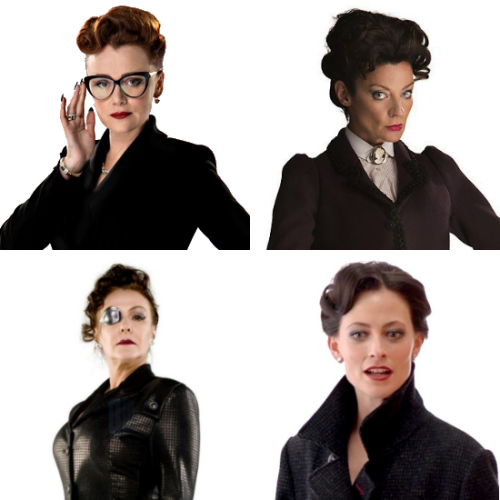 http://theblogofdelights.blogspot.co.uk/2014/11/doctor-who-series-8-dark-water.html BTW – Missy snogging the Doc? The Doctor’s “do you think I care for you so little?” speech was beautiful. There was a lovely subtle counterpoint at play here: through the course of this season the Doctor hjas allowed himself to become a little more human, while at the same time Clara has become gradually more Doctor-ish in her behaviour – her refusal to accept Danny’s death because it was so ordinary being a case in point. I fear we are heading next week towards something big that will be as heartbreaking as it is heroic. Heh. Although I wonder how much of it is Moff, how much is the writer’s vision and how much is the make-up team’s doing. Probably a combination of all three! Thanks for taking the time to comment, Mark. Actually, I hadn’t missed that point, hence my comment about the ‘representation’ of the afterlife. Moreover, my comment was more intended around how viewers would react to how the scenario was laid out before the revelation of the matrix data slice. For instance, if someone has been recently bereaved – and especially if their loved one was cremated – the idea of the deceased’s consciousness being able to feel what was happening to their body would touch a raw nerve. (Indeed, I’ve read a couple of people online who have subsequently said exactly that.) The subsequent explanation of the artificial nature of the afterlife doesn’t change how a viewer might be affected one iota.